June 2018 - 2018 Cambio Conference was held June 6-8, 2018, in Kansas City. See the program. The conference featured four plenary sessions, four breakout sessions, a poster session and competition, plus site visits. Over 160 people registered and engaged in dialogue on supporting integration of newcomers. How has the 2002 Farm Bill influenced food insecurity rates and food stamp participation among low-income Mexican immigrant families? Read full brief out of the Institute for Public Policy. October 2017 - See the semester calendar of events about immigrants and immigration policy. October 18: "Organizing after the Peace Accords: The Feminist Resistance in Colombia", 7pm in Stotler Lounge, Memorial Union; See flyer. Panel, dinner, and discussion. Details will be available here. With the ending of the DACA program, what do we know about the impact of DACA, and what will the end of the program mean to DACA recipients and our communities? What is next for the policy, the young people with DACA, and the universities, workplaces, and communities that have welcomed them? See resources list provided by MU Voz Latina. August 2017 - Speaker Dr. Judith Kroll will present on August 30 at 3pm, "Two Languages in Mind: Bilingualism as a Tool to Investigate Language, Cognition and the Brain". Details here. August 2017 - Language Services Program is Hiring: The MU Cambio Center is looking for bilingual MU students who speak, read, and write Spanish very well to assist its Language Services Program. Our work includes the translation of texts between English and Spanish, as well as transcription of recorded Spanish audio. We have flexible hours and sporadic work, and will provide ongoing training in translation techniques. 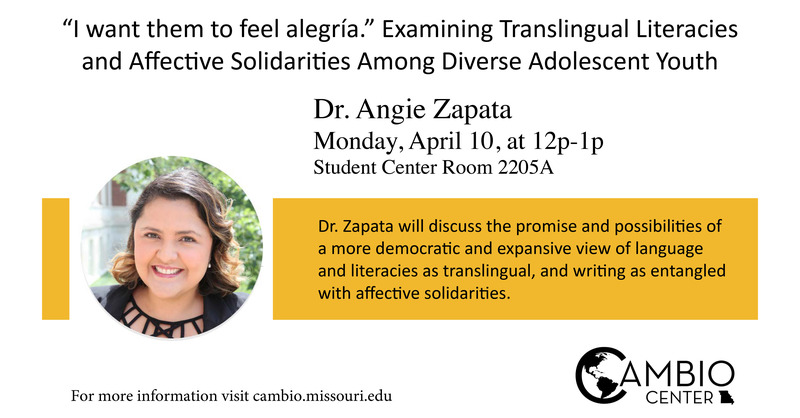 If you are interested please write cambio@missouri.edu. June 2017 - Engaged Conferencing! 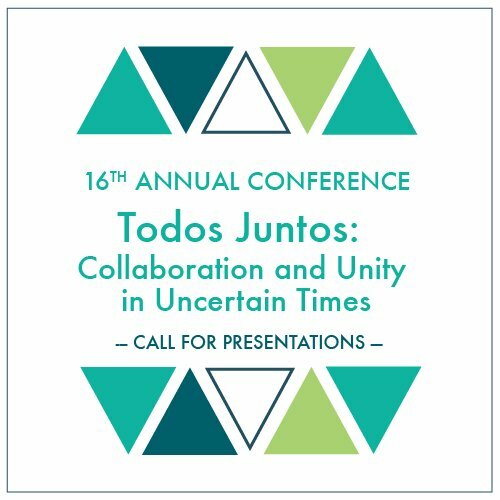 The 2017 Cambio de Colores conference was a success, as researchers and practitioners connected and shared their experiences and informed each others' work around immigrant integration. Thank you to all presenters, speakers, site visit hosts, attendees, sponsors, and collaborators for a successful conference! June 2017 - The 2016 Conference Proceedings are now available! The proceedings book for the 2016 conference includes nine articles (plus one available in Spanish! ), covering education, dual language education, public health, human trafficking, youth researchers, and more! 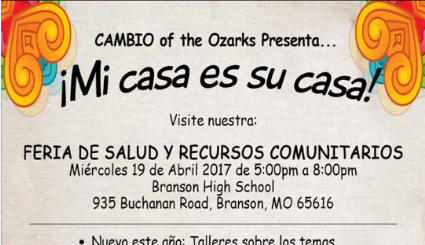 April 2017 - CAMBIO of the Ozarks is hosting their third annual "Mi casa es su casa" Health and Community Resource Fair. The local group has included members of public and private agencies and organizations and other community members and are focused on building bridges and strengthening connections between newcomers and receiving community. Details here. 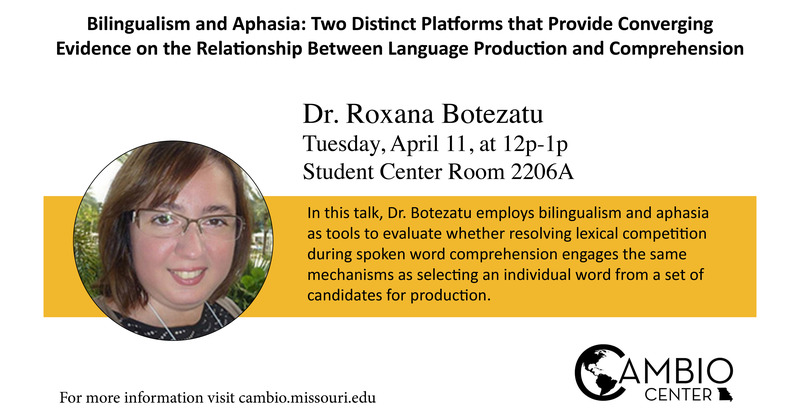 April 2017 - Cambio Center Fellows Seminars: Dr. Angie Zapata and Dr. Roxana Botezatu will be presenting their research, answering questions, and leading discussion in two events free and open to the public on Monday, April 10, and Tuesday, April 11. See events page for more details. December 2016 - New eBrief: The Outstanding Opportunities, but Persistent Challenges, of Dual Language Education, by Lisa Dorner, explores the research on the promise of Dual Language Education, as well as the difficulties. 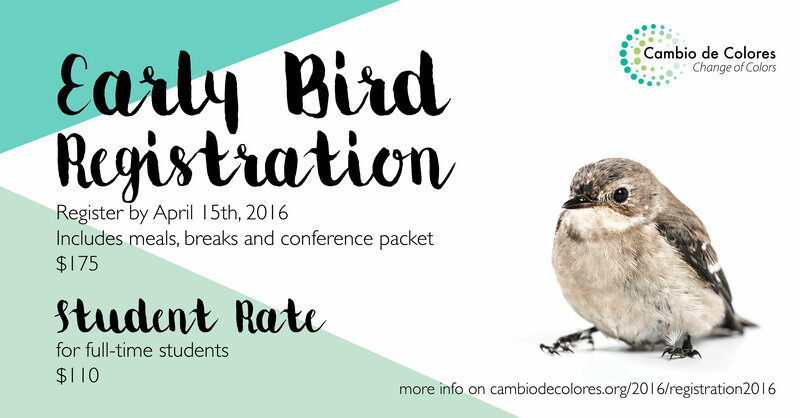 Fall 2016 - Call for Presentations: The 2017 Cambio de Colores conference has released a Call for Presentations for the June conference. Check it out and share widely. July 2016 - New Project: The Cambio Center is pleased to launch the Latino Agricultural Entrepreneurship Project, funded by the USDA's Agriculture and Food Research Initiative (AFRI). Led by faculty from the University of Missouri, Michigan State University, and Iowa State University, it is designed to explore the needs of Latino farmers, understand their unique livelihood strategies, and better prepare agencies to work with Latino farmers. See the project site. 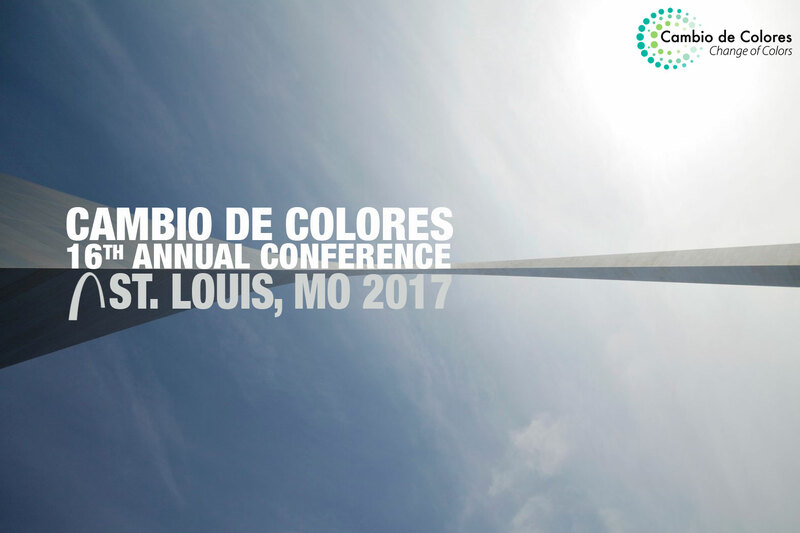 July 2016 - The 2017 Cambio de Colores Conference: The 2017 conference will be in St. Louis! Contact decolores@missouri.edu to join the planning committee. Thank you to everyone involved in the 2016 conference! With 170 registered participants from 18 states, the conference included 62 presentations in 25 breakout sessions, four plenary sessions, three interactive theme activities, and 14 posters. May 2016 - The 2015 Proceedings Published: The proceedings book of the 2015 conference is now available! With seven selected papers and all the abstracts from the conference, this book is a spectacular resource. The Cambio Center's digital library can be searched in MOSpace. 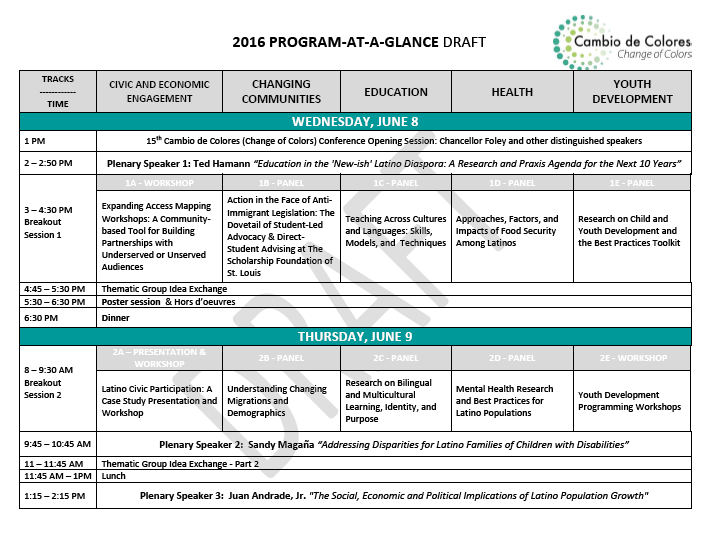 April 2016 - Conference Program: Cambio de Colores Conference draft program and Program-at-a-Glance is available. See the titles of plenary speakers and breakout sessions here. April 2016 - Translation Fees Updated: Cambio Center's Language Services Program has updated its translation fee schedule. April 2016 - Afro-Cuban Artists Conference: Fellow Juanamaria Cordones-Cook is project director of the upcoming Afro-Cuban Artists: A Renaissance conference, April 27-30, 2016. Register today for this fantastic opportunity! March 2016 - Newsletter: See Conference news, our new fellows, fellows' updates, and opportunities in our March newsletter. 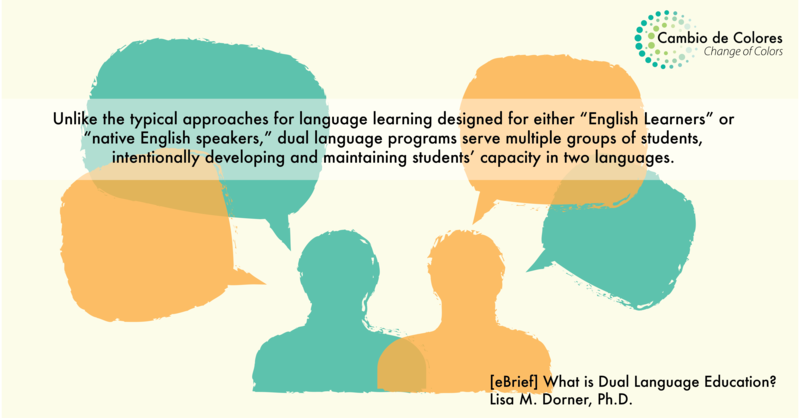 January 2016 - Dual Language Education eBrief Published: Read Cambio Center eBrief: What is Dual Language Education? by Dr. Lisa M. Dorner in ELPA. Spring 2016 - Welcome to New Cambio Center Fellows: The Spring 2016 semester, we welcome new fellows: Sujin Kim ( Postdoctoral Fellow in Educational Leadership and Policy Analysis); Gerardo Martinez (Director of Alianzas); Mattie Hill (Masters student in Agricultural and Applied Economics); Andrea Tappmeyer (Doctoral student in Sustainable Development); and Lina Trigos Carrillo (Doctoral student in Teaching, Learning and Curriculum). See our full list of Fellows and some of their updates at Fellows News. December 2015 - Domingo Martinez Retires: Domingo has retired after almost 25 years at the University of Missouri. 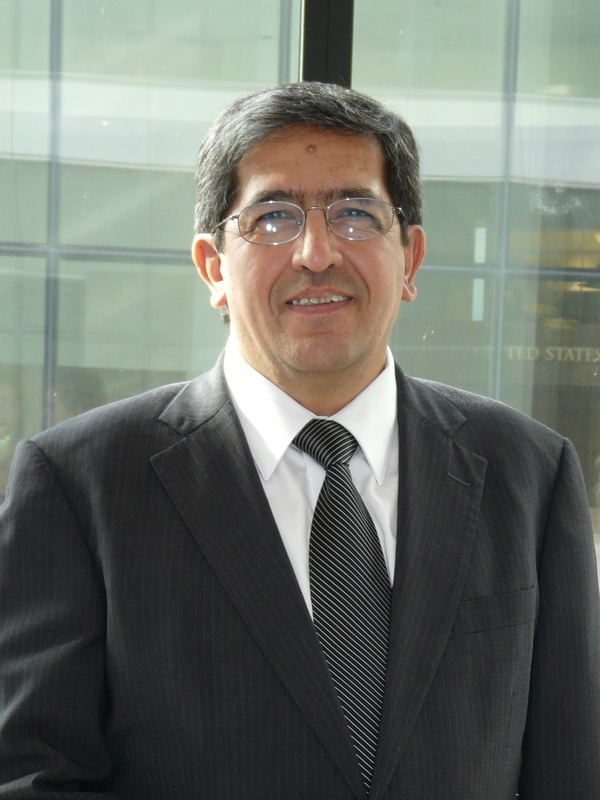 Domingo served as the director of the Cambio Center from its founding in 2004 through January 2015. 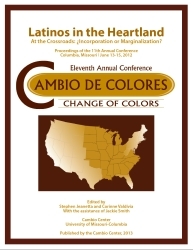 He has been involved in the Cambio de Colores conference since its inception, and directed it for several years. A reception to honor and thank Domingo will be held February 11 at 3:30pm. December 2015 - Latino Farmers and Ranchers: Alianzas's December newsletter features Cambio fellow Eleazar Gonzalez! Fall 2015 - Welcome to New Cambio Center Fellows: The Fall 2015 semester, we have had the pleasure and fortune to welcome several new fellows and student fellows to the Cambio Center. New faculty fellows include Roxana Botezatu (Communication Science and Disorders), Jamille Palacios Rivera (Agricultural and Applied Economics), and Daisy Collins (Reading, Foundations and Technology at MSU). New student fellows include Aaron Arredondo (Sociology),Michael Hendricks (Political Science), Van Nguyen (Educational Leadership and Policy Analysis), andErin Smith (Math Education). See all of our fellows here. 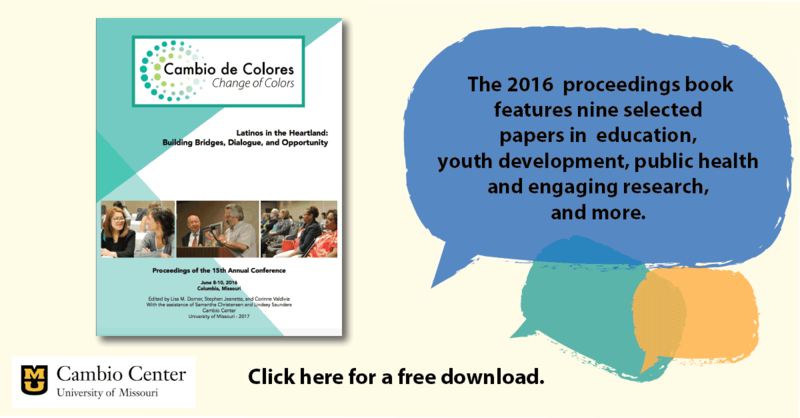 November 2015 - The 2016 Call for Presentations: The Cambio de Colores (Change of Colors) Conference planning committee has released the Call for Presentations for the 2016 conference. Share your knowledge and experiences today! November 2015 - Solidarity Statement: The Cambio Center has released a solidarity statement in support of students' efforts to address racism and other forms of oppression. Our next brown bag lunch (11/18/2015 at 11:30a in the Cambio Center) will focus on drawing lessons from our research to support improving our campus. October 2015 - Newsletter: The October Newsletter announces the Conference title, welcomes a new faculty fellow, and has more news for you to use. October 2015 - Fellow's Research: Fellow Dr. Stephen Christ was featured in the Academic Minute: Authenticity of Mexican Restaurants. September 2015 - Newsletter: The September Newsletter has updates from Fellows, new Student Fellows, upcoming activities, and more. September 2015 - Translation Training: The Cambio Center's Language Services Program is offering once a month opportunities to learn or improve your skills as an English/Spanish translator. The classes are free, 1.5 hours interactive trainings with real life, practical examples for hands-on experience. This semester dates are: Sept 28, Oct 26, and Nov 16 at 3:30pm. Sign up here. September 2015: Events: Mizzou's Latin@ Heritage Celebration calendar of events is available. This is a celebration of Hispanic Heritage Month (Sept. 15 - Oct. 15). August 2015 - Newsletter: The August Newsletter has updates from Fellows, some upcoming activities, and much more. August 2015 - New website: The Cambio Center has recently updated its website. Please let us know what you think and if you have any troubles while navigating around! Contact the Cambio Center. July 2015 - Change in Missouri: Illumination magazine explores change in Milan, Missouri, and the Cambio Center's contributions. 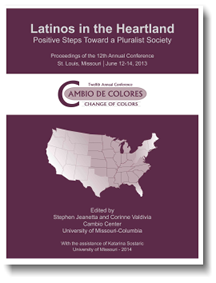 July 2015 - Alianzas News: Alianzas highlights the Cambio de Colores conference in its newsletter. 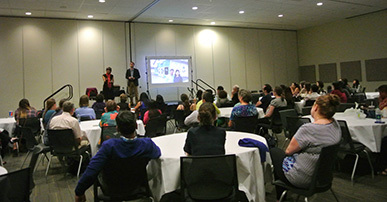 The 2015 conference was an exciting gathering of practitioners, researchers, educators, community members, students, and other professionals from across the Midwest and the United States.This energetic annual meeting of people working on immigrant integration continues to grow and foster new ideas through the exchanges of research and best practices across many fields. 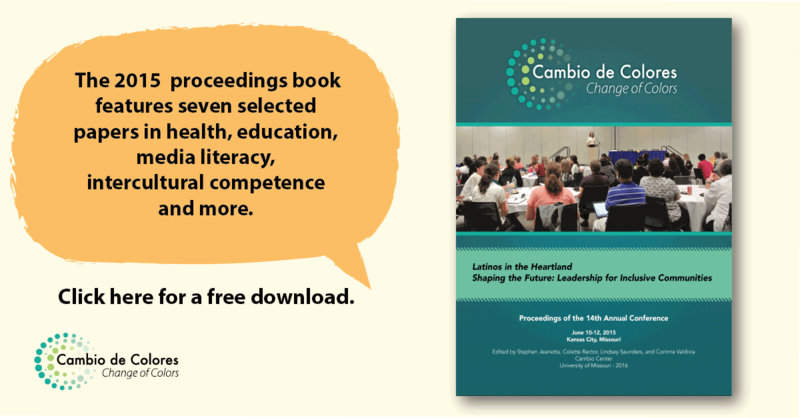 June 2015 - The 2014 Proceedings Book: The Cambio Center has published the proceedings of the 2014 conference. Published by the Cambio Center, University of Missouri, (84 pp.) Download full 2014 Proceedings book, free of charge�(PDF file - 1.8 Mb). Contact us for a copy. May 2015 - Newsletter: See Cambio Center's May 2015 Newsletter, where we welcome new Fellows, share info about our Language Services Program, and share updates from Fellows. Spring 2015 - Research Article: The Integration Project was featured in the Julian Samora Research Institute's Spring 2015 version of Nexo. The article, "Latino and Latina Immigrants in Rural Communities of the Midwest: The Role of Cultural Identity in Wellbeing and Job Satisfaction", starts on page 18, and was written by Corinne Valdivia, Lisa Flores, Stephen Jeanetta, and Domingo Martinez. February 2015 - Research Results: Cambio Center student fellow Sarah May (and co-authors) share findings from focus groups held by the Immigrant Integration project in the Journal of Latina/o Psychology. February 2015 - Project Completion: The Immigrant Integration & Sustainable Rural Development: Linking Receiving and Newcomer Communities project has completed a survey of 240+ households that marked end of the four-year mixed methods research project in three rural Missouri communities. See some of the project's publications. The University of Missouri has recognized and thanked Domingo Martinez for his dedicated service as director of the Cambio Center since its founding in 2004. Domingo has provided key leadership in the Cambio Center's work for the past ten years, and has also played an integral part in the annual "Cambio de Colores (Change of Colors)" conference since its inception in 2002. Vice Provost for International Programs Dr. Handy Williamson has worked with the Cambio Center Executive Board to select Dr. Stephen Jeanetta to serve as Interim Director. For more information, see our March newsletter. 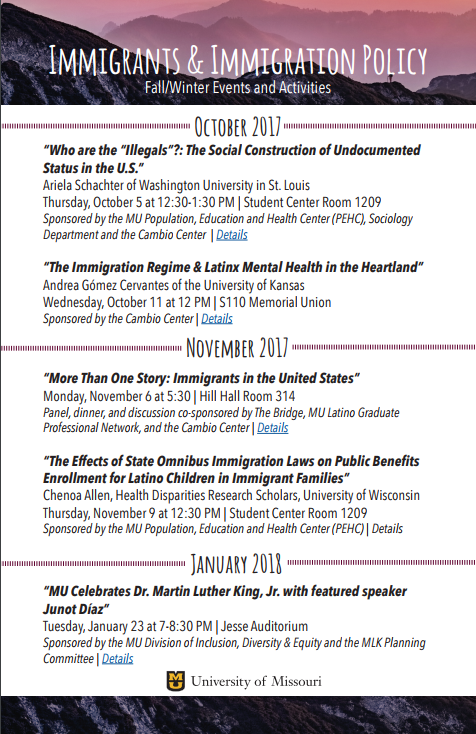 Fall 2014 - 10 Year Anniversary: MU’s Cambio Center celebrates 10 years of research and outreach on Latinos and changing communities in Missouri. The center invites you to learn more about its research and its Fellows’ research. For more information, see the 10 year celebration flyer. 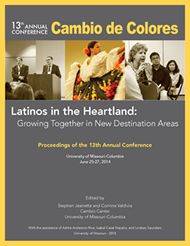 June 2014 - In the News: "13th annual Cambio de Colores Conference promotes immigrant integration" (June 26, 2014) in the Columbia Missourian. February 2012 - Research Article: Valdivia, Corinne, and Lisa Y. Flores. "Factors Affecting the Job Satisfaction of Latino/a Immigrants in the Midwest." Journal of Career Development. February 2012 39: 31-49. DOI: 10.1177/0894845310386478. (Abstract / Full Text (PDF)). This Cambio Center interdisciplinary study examines the job satisfaction of 253 Latino/a newcomers in three rural communities in the Midwest. Specifically, the authors explore the effects of ethnic identity, Anglo acculturation, Latino/a acculturation, perceptions of the community (social relations, discrimination/racism, and language pressures), job tenure, work hours, and salary on participants’ job satisfaction. January 2012 - Sharing Research: Cambio Center fellows reach Agricultural and Applied Economics professionals in Choices, with article about Latino/a wealth and livelihood strategies. September 2010 - Project Completed: The Cambio Center's research project Asset Accumulation Strategies in 3 New Settlements Communities, funded in 2006 by a competitive grant of the USDA's National Research Initiative (now Agriculture and Food research Initiative - AFRI) finished in September 2010 after four years of intensive and ground-breaking work. The project's website has an up-to-date list of articles and presentations. The unique and large data set will continue to be analyzed, and more products will be coming to support the integration of newcomers in Missouri and the Midwest. Coloquio Internacional "Migrantes regionales en las Américas. Casos de Argentina, Brasil, Chile y Estados Unidos"
Una iniciativa del Cambio Center. A Cambio Center Strategic Initiatives project, in cooperation with the Centro de Estudios Migratorios Latinoamericanos (CEMLA), Universidad de Buenos Aires, Universidad San Martín (Argentina), Universidad de Chile.